Cloud technologies open up new avenues of data and application availability, but confusion over how to adopt and realize the benefits of the cloud has been intensified by "Everything-as-a-Service" - a result of vendors trying to spin existing technology as something new. Another valid point of contention is lack of confidence in security as hypervisors, the software agents that manage groups of virtual machines, are vulnerable to attack. However, implementing a multi-tiered cloud strategy offers flexibility for the level of protection required for critical workloads and the cost-savings of inexpensive cloud services. 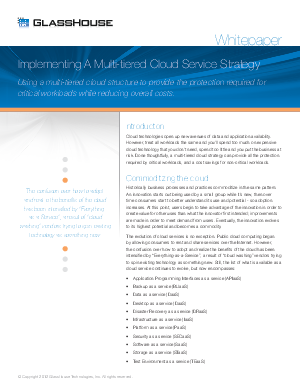 This whitepaper outlines how to execute a unified, on-demand infrastructure to enable organizations to make the best of cloud technology.